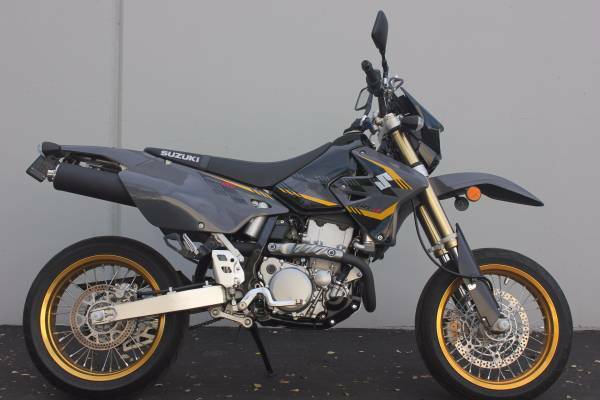 Check out our 2016 DRZ400SM we have in inventory. The birth of a new street fighter motorcycle, in the triumph family, came around 2005. 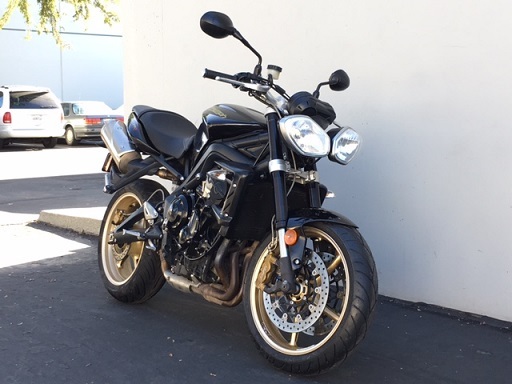 The street triumph R is a combination of a Daytona 675 and the street triple 675. Below is a picture of a 2012 Street Triple R that can reach 145 mph if you can hold on. The bike has Daytona’s identical suspension and brakes. The suspensions performance is closer to that of a Daytona yet, it is fully adjustable for the shock. Luckily for us, we currently have this bike in our inventory. Click for Triumph. This high speed rocket has lightweight wheels, cosmetic changes such as the bug eyed lights, 2 kg reduction in weight and a newer gearbox. 10 of the 12 gears are redesigned with new selector shafts and drums. Even though it is a street bike, this highly compatible motorcycle can function as a track day tool. Many have said that it is worth the extra cash as opposed to the standard model. But then how often do you need that extra power? Especially if you’re only riding the bike on the street! If that’s the case, then the standard model will do fine. The triumph street triple has better ride quality, stops and handles brilliantly. If you’re looking for Motorcycle boots that look nice in public, then they’re probably not going to protect your feet. Motorcycle boots are highly relevant for bike riders, especially new riders. There are a variety of motorcycle boots for street use, off-road riding, cruising, racing, etc. Either way, when purchasing riding boots, we encourage consumers to consider various factors such as construction closures, materials, and height. A full-length boot is imperative in protecting a rider from foot and ankle scrapes, breaks and sprains. Even though it may be uncomfortable and stiffer, it does a world of difference when it comes to protecting a rider during an accident/crash. The ankle bone is protruding out and is more prone to injury during a slide or fall. Most times, the foot gets stuck during a collision, and the weight of the bike lays on the riders leg while it slides on the road. Having the height ensures that your ankle and foot is protected as opposed to having boots that are below your ankle. Motorcycle boots are made out of high-grade leather that is thicker and more abrasion resistant. They are also all weather protection built to protect the rider from the elements. Another useful feature of riding boots is the buckle strap. Laces tend to be more popular due to their easement of slipping one’s foot in and out, however, laces may be dangerous if they are snagged/ripped/caught anywhere on the bike or road. It is best to get a boot that has a buckle strap to secure the laces and ensure safety is at it’s highest. Another feature to look for in riding boots us the stitching. The best boots will be triple or double stitched to assure it doesn’t come apart in an unfortunate accident. Motorcycle boots with steel toes are also considered the best when it comes to protecting a riders foot and preventing injury. One thing that shouldn’t be ignored is the care of your motorcycle boots. They are an investment made by you for your safety. Cleaning your boots after a ride on the streets/freeway won’t take much longer than 5 minutes. Using a damp cloth will keep your boots clean and free of dirt. Neglecting to care for your boots properly will mean the difference in its safety abilities and longevity. Using the proper cleaning products for the boot material you have is important in its maintenance. They should be treated with a cleaning product that is made for the type of material your boots are made out of. This is the only way proper motorcycle boots maintenance is recommended. Considering all these factors, buyers should consult the dealers of the motorcycles they are interested in purchasing. Asking questions about which boots to purchase or what to consider when researching helps in making the right choices. Comments Off on Reliable Motorcycle Brands? According to consumerreports.org from a survey of about 11,000 consumer report subscribers, Suzuki, Yamaha and Honda ranked in the top three for the most reliable motorcycle brands. And we mean by the percentage of failures that have occurred from all brands that were surveyed. They all held 11%, 12% and 12% respectively with Yamaha being the top ranking company. Kawasaki came in fourth at 15%. Ducati, Can-Am, BMW and Triumph were the highest rated for trouble-prone bikes coming in at 29% (Triumph), 33% (Ducati), 40% BMW and 42% for Can-Am. The higher the percentage, the more likely you are to have a problem with the bike (estimated). Luckily for you our readers, Ak Motors Inventory consists of generally a significant collection of Yamaha, Honda, Suzuki and Kawasaki bikes. These four brands account for 98% of our inventory. Go ahead and click on the following links for more information about what we currently have in stock. If you don’t find the one you’re looking for or you have more questions, call us at (408) 444-5187 or email us Adi@motorcycles.com. Check us out on Instagram Page for weekly pictures of our spotlight inventory. Like us on Facebook page! How to tips: What kind of helmet should you choose? Comments Off on How to tips: What kind of helmet should you choose? There are three standards of safety on helmets that you should look out for when examining helmets- ECE, SNELL and DOT. SNELL would probably be the best choice since its regulations are very strict for crafting helmets. DOT has a set minimum standard of protection and these helmets are usually open from the cheekbone down to the chin. Many writers have said that the ECE is of a similar low safety standard as compared to DOT. During your research for helmets, you should consider material choices, controls and weight, shield options & Visibility, aerodynamics and the safety factors of any helmet. There is a Previous Helmet Posting that points out the specifics, fit, certification, type and usage of helmets. It provides detailed information that would help anyone in choosing what factors to consider when purchasing helmets. As we have always said, AK Motors highly values customer safety and we will work with you to ensure that you are getting the best advice around when it comes to motorcycles. Giving us a call (408) 444-5187 or email us at (Adi@motorcycles.com) with any questions you have. Ensure that your gear can keep you warm. Once the body experiences cold, you are more likely to be less concentrated on the road. Waterproof gloves are recommended to keep your hands warm. They are the first parts of your body to get cold typically, and they go numb. This will interfere with your ability to ride safely. When braking in questionable conditions, apply light pressure as NOT to lock up the wheel. Applying the brakes abruptly as you would during dry conditions will almost always take you and the bike down. Apple more rear brake than the front. You can quickly correct if something happens from the rear wheel than the front. Allow yourself more room to slow down, stop and turn. It is a good habit to check your tires frequently for defects, damage, wear, and proper inflation. A tire in the proper condition will help you survive on the roads when weather conditions are against you. If your tires have no grip or tread, DO NOT RIDE IN THE RAIN and change your tires as soon as possible. Ease on the throttle when you are pulling away from a stop light/sign. Do not ride in the center of the lanes in wet conditions, these become more slippery as grime rises. Ensure that you are wearing the proper gear for wet conditions. It is best to wear a reflective jacket for high visibility and a full faced helmet. Rain at more than 32 mph hurts. Watch out for puddles! You do not know if the puddle is 10 inches deep or 3 ft deep. When riding on the roads, REDUCE your speed. Spray some RAIN-X on your visor. This allows for more visibility since helmets do not have wipers. These are just some tips that we have. There are more articles on the web with even more details about riding in the rain. Please ensure that riding safe is your top priority. Here at AK Motors we are proud to offer one of the best used motorcycle selections you’ll find in the Bay Area. If you’re in the market for a used bike, check out our online inventory or contact us for an appointment. To see our current inventory and explore more details, check out our Inventory page! We are located in the heart of the Silicon Valley in Santa Clara, CA with easy access from all over the Bay Area. We offer financing for all credit levels! Apply online here, and contact us with any further questions. Checking a bike’s oil level is crucial to its operation and longevity. An engine is the heart of the motorcycle, and the oil is its lifeblood. An engine’s contact points (metal to metal) needs continuous lubrication (oil) to keep parts from sparking, grinding and eventually breaking down. Let’s just say that engine oil is one of those things that should never be neglected for any motor to run at full potential. Engine oil can also reveal information about the internal condition of the motor even to a novice mechanic. Most mechanics advise checking the oil when it the engine is warm, and others say that checking engine oil is best when it’s cold. We say, please check the manual that came with your motorcycle from the manufacturer, and inside it details the best conditions to check engine oil for that particular bike. However, most online motorcycle journalists list making sure that your engine is at operating temperature is the best way to check. Before you start, you should take a quick ride around your neighborhood to ensure that the oil is circulating. When you get back, park the bike for 15 minutes. This allows for oil to drain and return to original position naturally. The bike needs to be in a horizontal position when looking at the sight glass. The reason being is that you will get a false reading if the bike is leaning.Here is a before and after picture of an oil engine reading while the bike is leaning on its stand and after in an upright horizontal position. While the bike is in its upright horizontal position, always ensure that the oil level is between the two marks that are highlighted by red strikes in the pictures above. 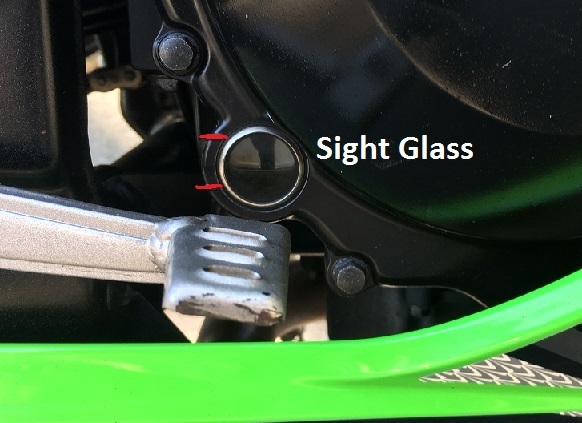 Evans Brasfield of motorcycle.com has the following tip: “If your bike has both a center stand and a sight glass, measure it the above way and then compare it to the level shown while on the center stand. 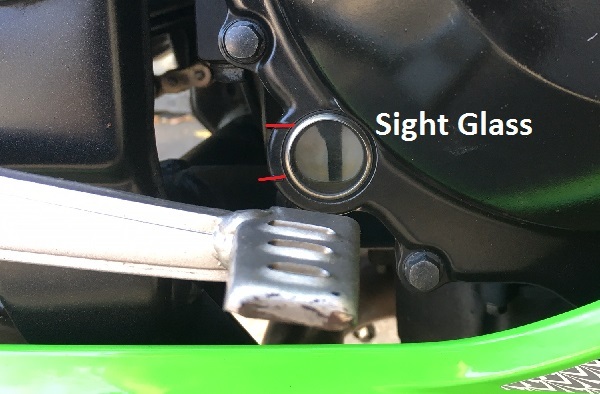 This way you can use that level as a reference so can check the oil level when it’s parked on the center stand in your garage.” Please make sure that you check with the motorcycle manual about how to insert the dipstick correctly for an accurate reading. Those who ride regularly should do the oil inspection weekly. Those that ride now and then should check before each ride. You should also use the same type of oil each time you replenish your bike’s oil level. Happy Riding! 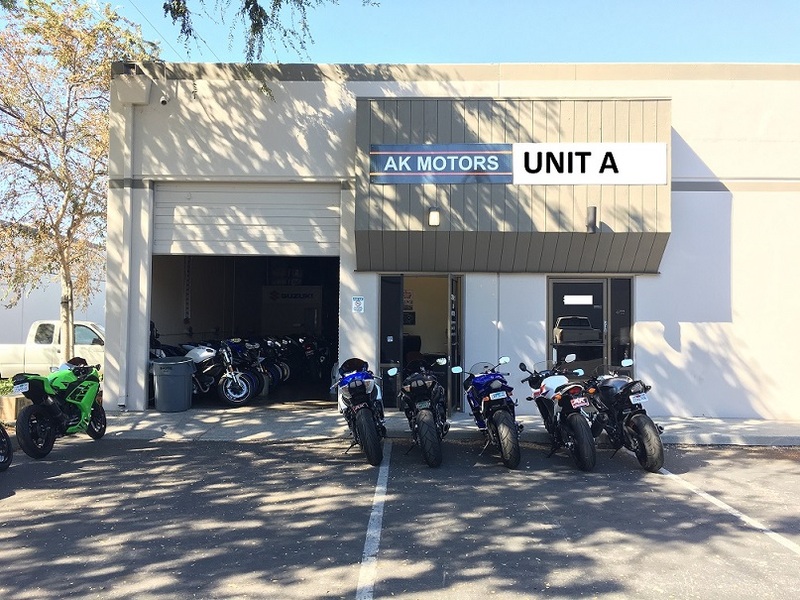 Here at AK Motors we are proud to offer one of the best used motorcycle selections you’ll find in the Bay Area. If you’re in the market for a used bike, check out our online inventory or contact us for an appointment. To see our current inventory and explore more details, check out our Inventory page! We are located in the heart of the Silicon Valley in Santa Clara, CA with easy access from all over the Bay Area. We offer financing for all credit levels! Apply online here, and contact us with any further questions. Excitement and enthusiasm can cause one to overlook any bikes potential flaws. Most people are taken by the color scheme, look and overall presentation of a bike. One thing to note is not everyone is an expert at motorcycle purchasing. And for that, here at AK MOTORS, we’ve put together a little checklist in order to guide/assist anyone who is looking to purchase a used motorcycle. First things first, patience is a must. We want to ensure prolonged happiness with your new purchase. Continuous research on the internet with multiple used dealers can cut the time down from a wasted visit. Also, please be sure to check out dealers review business pages on Yelp, google or yellow pages. If you didn’t know, Ak Motors is a 5 star business on Yelp. On the other hand, finding the perfect bike might not come immediately to most that’s why we encourage a bit of research before visiting a dealer/private party. Also, if you’re purchasing from a private party, the following list may guide your purchase. If you have properly checked everything on the list up to now, then now you must check the VIN # (especially if purchasing it from a private party). This will ensure that the bike is not stolen or that it doesn’t have back fees on it. Also, you will want to know how much will it cost you to register the bike. Check the title of the bike and make sure it matches the person’s name who is selling it to you. If it is a dealer, then you shouldn’t have to worry too much about it, but it is always good to double check. Title discrepancies can be costly and a headache to fix if you’re not careful. If you see this during your purchase, leave! Do allow yourself to be pressured into purchasing a bike. If you’re at a dealer, ask the tech to go over the details of the bike for your comfort. You would be surprised at how many would be willing to help. BRING A FRIEND! It is always good to bring someone who knows something about motorcycles/bikes. Your friend will help keep your excitement in check. Over excitement can cause anyone to overlook minor issues. It is ok to take all the information you have gathered back to your home to research research research! You do not have to purchase a bike/motorcycle the day you look at it. Look for other used bikes of the same kind at other websites to ensure you’re getting the best price. One of the best things about AK MOTORS is our unbeatable prices combined with high customer satisfaction. Check out our Inventory for more information on a wide range of used motorcycles. Also, contact us for an appointment. We are located in the heart of the Silicon Valley in Santa Clara, CA with easy access from all over the Bay Area. We offer to finance for all credit levels! Apply online here, and contact us with any further questions. Our spotlight for this week is the Ducati Monster 696. A redefined style with Ducati’s trademark L-Twin engine pushes this bike to the forefront of the Ducati line. The Italian engineers managed to trim the weight to 354 lbs to allow for improved engine output to 80 Desmo horsepower. The ergonomics have improved with changes to the riding position. The bike allows for a lower and shorter reach with a forward footpeg position that empowers any rider to master it. The exhaust system gives the underside of the Monster a cleaner appearance with bold Ducati mufflers. Let’s not forget the advanced APTC clutch which allows for safer down-shifting and it helps keep the clutch lever movement easy and lighter. This works for those riders in areas that require frequent stops continuously. High torque and excellent handling can make this bike addictive to any rider when in motion. 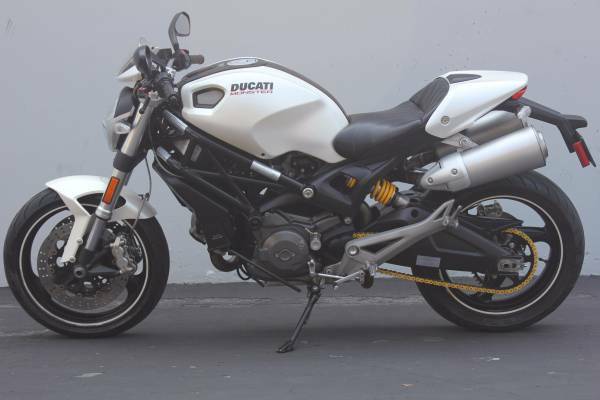 Here at AK MOTORS, we currently have a 2009 Ducati Monster 696 for sale. Click on the link to check out this beautiful naked motorcycle that is in excellent condition. Here is another link to our inventory page to see the many motorcycles we offer for sale at unbeatable prices. If you’re a rider in the Bay Area, you’ve probably ridden through or at least heard of the legendary Highway 9. You’ve also probably checked out our inventory and seen that we have some of the best prices in the Bay Area for used motorcycles. We are a 5 star business on Yelp and we are extremely proud to continue satisfying customers since 2007. Highway 9 is a 39 mile stretch between Santa Cruz and Los Gatos in Northern California. Highway 9 takes you through several cities (including Saratoga and Felton), close to the redwood forests and through the Santa Cruz mountains. The long stretch provides an adventurous ride with beautiful scenery. Conveniently placed close to highway 9 are hiking trails through the redwood forest, one of the oldest Japanese garden estates, the famous Mountain Winery amphitheater, the Howard Cowell state park, the covered bridge and the infamous Alice’s Restaurant. The restaurant is dedicated to motorcyclists as it’s roots are tied to the roads that lead to it. With names on the menu like the Ducati Special, it’s hard to ignore their links to the motorcycle world. The restaurant has/is always a well-liked spot for tourists, motorists, and bikers. Most bikers who have ridden Highway 9 claim it is a must travel destination on your visit to San Francisco. Even if you are local, get out on your motorcycle and take a trip through this scenic route. On the weekends, the road is known to be well populated, and the turns can get twisty. We highly recommend traveling at a safe speed while navigating the turns and always be aware of your surroundings. Check out our 09 Ducati 696 for a special ride on Highway 9. Don’t forget to stop by Alice’s Restaurant for that Ducati special!